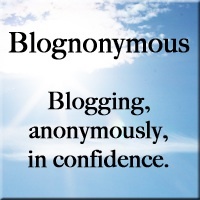 Today’s post comes from a blogger who is choosing to remain anonymous. Their story will doubtless resonate with many, and your comments and thoughts are really appreciated, as always. If you’ve got a story you’d like to share, and nowhere else to tell it, please feel free to get in touch with any one of the blognonymous team for how we could maybe help. “You don’t know where your mother ends and you begin” was how one unusually insightful counsellor once summed me up. “You are so busy trying to make your mother happy, that you do not know where your own happiness lies. The depth of responsibility you feel for her is inseparable from your desire to live your own life. My mother has a complicated past. Hated by her mother for being younger and more beautiful, she married young, just to get away. The marriage was doomed of course. She became ill. So ill that her family made decisions for her. Sent her away without her baby daughter, to a country thousands of miles away. Her health deteriorated over years until at barely 7 stone she was unable even to walk down the street. She survived of course, and went on to marry my father. But the marriage was brief. The bouts of depression which she had suffered since those first dark times continued. She never remarried. So, inevitably, my childhood was punctuated by her unhappiness. Her loneliness. The self doubt she was unable to share. So she came to rely on my sister and me for her inspiration. Her happiness. A dangerous thing. To be so closely entwined. In her quiet, broody moments I learnt to wonder “Is it me? Have I done something?” And I tiptoed around. Afraid of doing the wrong thing. Making a mistake. I remember spending weeks paralysed with worry about what my mother would say when i accidentally lost my house keys. Can recollect a moment in time where I had been sent to the airing cupboard to get a towel but stood frozen for ten minutes, so afraid of choosing the wrong one. “Why would you choose that old thing.” or “Don’t be so silly, that isn’t nearly big enough”. Such small criticisms, seemingly insignificant, that so smart in youth. Even now I struggle with decisions. Procrastinate endlessly over the smallest details. Still scared of letting her down. And of course, my desire to make her happy was, and is still, ultimately insatiable because I strive for something that even she doesn’t know how to achieve. I have spent a long time angry at her. Angry for making me feel responsible. For the guilt. I have kept my true self hidden. Never divulged too much. Avoided criticism. Being the cause of her bad moods. Her disappointments in life. And we have emotionally drifted apart. When the thought would enter my head I would struggle for breath. I felt as if all the sinews and muscles inside my chest were tearing. Just from the thought of it. Despite the pressure I feel. The sadness. The anger. I love her without boundaries. So I started on this blogging journey. To open myself up. Help build a relationship based on honesty and feelings, rather than worry and regret. Before it was too late. And she reads every post that I write. We are talking more, and i am finally starting to believe that she is proud. Such a proactive and empowering decision by both of you, one to open up and the other to listen. I hope it has a great result. Funny, I am writing about dating reflections of our mothers (and fathers) at the moment and it’s a very emotive subject. I know exactly what this woman is talking about as I sadly experienced my own fraught relationship. What her counsellor said was sort of said to me by a counsellor, albeit in a more crass way where after four sessions she got really exasperated with me and told me that she thought I’d come to talk about my ex and instead I had talked about my mother – i didn’t even realise I was doing it. Sadly my mother has read my blogs but it hasn’t ‘triggered’ anything – at keast not anything long lasting…. The counsellor could have been talking about me too. In fact mine said that almost word for word. This was a beautifully written, beautifully expressed post. I am so glad that blogging is empowering you and also acting as a way of bringing you closer together. You are wiser than me. The only way I have been able to heal some of the damage that has occured through my relationship with my mother is by having my own children. I have stopped the legacy that has been passed down via her mother, grandmother etc. The legacy that says you have to criticize and undermine. I wish I was brave enough to talk to her about it. She reads my blog but sometimes even that falls under her spell of negativity. I hear her voice all the time – the one that says “it’s not good enough”. Distance is the only way I know how to deal with it. I hope you can come to a peaceful place with yours. Forgiveness is always a good place to start. I try to remember her beginnings and just like your mother’s recognise what that caused. It’s easier said then done though. I love my mother too. I have so much to say but am sure you have heard it all before. I want to offer you just this. Take all of that pain and use it to build yourself into the strongest and best person you possibly can. You have great insight, you it. I have found that the more I work on myself and understanding myself, the less outside influences (even childhood ones) come into play. If you ever need an ear or want to chat, you can find my email on my blog. Fantastically written, and so wonderful that you are able to let this out AND see that you are able to go somewhere with it. It takes great strength to take things like this on board, to put yourself out there, and I hope that as time goes by, not only will you enjoy your mum being proud of you, but that you will also feel proud of yourself, for everything. I’m glad you’ve found a way to open communications with her. I hope that your communications continue and that you can believe in her, and yourself, again. One step at a time – it’s a great gift that you and your mum want to and have the time to repair your relationship and rebuild it. I so recognise myself in this wonderful, brave post but unlike you, my mum is not around nor did we ever speak about it. You are so lucky to have the time & opportunity to build something wonderful together. Wonderful post. I really identify with this. My mum had a breakdown in the years after she lost my dad and was so lost she came to live with us. I was desperate to make her happy again and set myself up to fail – we cannot be totally responsible for how someone else feels, but that doesn’t take away the feelings of guilt when the impossible cannot be achieved. Good luck with your blogging journey.